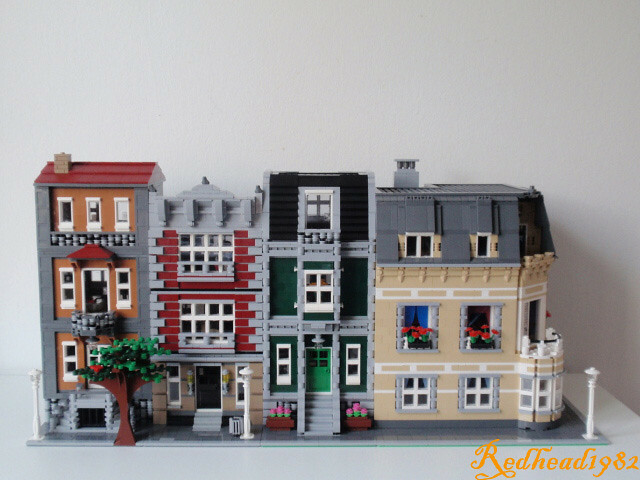 Brick Town Talk: Dark Streetcorner - LEGO Town, Architecture, Building Tips, Inspiration Ideas, and more! Plumber Street- (BTT) It's always nice when someone makes a beautiful Modular building, but it is even better when it's an entire street of them! Firstly, there's the great Nougat house, with amazing stonework on the front of the facade, and a great girl's bedroom on the top floor. Next is the Dark Red, American style building, sharing some DNA with the Fire Brigade. Then we come to the Dark Green Canal house, showcasing a great kitchen, complete with a dining table and spiral staircase. Finally, we come to the Tan corner building, with an awesome reading alcove. The only thing that all four buildings are missing? A bathroom! EDIT: Oops! I've been informed by the builder that the corner building has a bathroom! Looks like all four buildings will have to share! Duncan, thanks for the kind introduction. There's only one thing I'd like to comment, and that's the fact that there actually is a bathroom included in the corner house (and is street-shared :-) ). This is cute! looks so pretty!